Blade Runner 2049 (my latest review) is the long-awaited sequel to 1982's cult hit, Blade Runner. Guess what, I'm gonna compare the two films outright. Like GEICO, it's what I do. "2049" is forty-five minutes longer than Blade Runner, "2049" expands on Blade Runner's universe from three-plus decades ago (yet there's no unfeigned connection), and "2049" is a little more violent and more action-packed. Still, Blade Runner 2049 is discombobulated. It's an inferior product that doesn't quite manifest as a rightful companion piece. There's less mystery, less darkness, no hypnotic Vangelis music, and less of a noir feel this time around. Sadly, those are the things I liked about the first outing. Now would I consider Blade Runner from 82' a masterpiece? Not quite. I'd still recommend it though. The storytelling is tighter than in "2049" despite both flicks being vehemently slow-paced. Blade Runner is a pioneer in the visual effects department and has a poignant, ironic ending. Blade Runner 2049 by comparison, is a nettlesome exercise that has too many ideas and tries way too hard to be relevant. Sure its look is decent enough. But with a bloated running time, some scenes that should have been left on the cutting room floor, and some shaky editing, Blade Runner 2949 ends up being an annoying, sci-fi slog. People all over the world have been debating the humanoid status contained in the first Blade Runner. These fanboys have been doing it for the past thirty-five years. With "2049", they'll probably just sigh and wonder what all the new fuss is about. 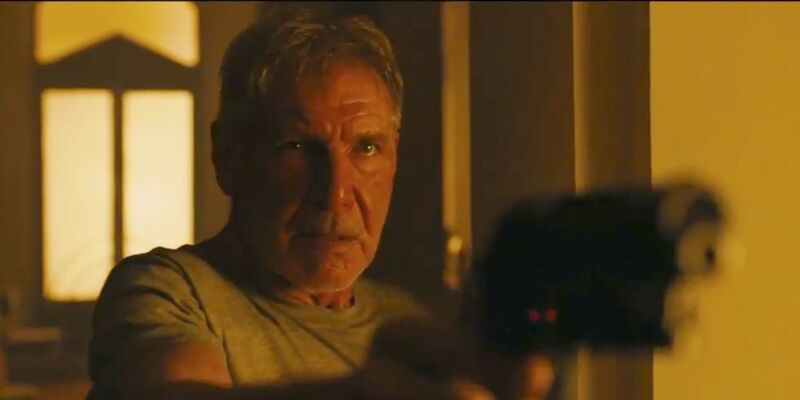 Harrison Ford reprises his Rick Deckard character for what feels like a minuscule cameo. Regrettably, he doesn't act with the mannerisms of Deckard enough to think that you believe he's back in Rick's nominal saddle again. It's almost a thankless performance. Then you have Ryan Gosling in the lead as protagonist K/Joe. Gosling is basically playing himself here. He's quiet, solemn, and appears like a less nastier version of his Driver trouper from 2011's Drive. Finally, there's Jared Leto as the ill-defined villain in Niander Wallace. It's Suicide Squad all over again because Leto barely registers in his role. It's like his presence feels akin to a separate motion picture altogether. That can't be good. All in all, Blade Runner 2049 unfortunately comes off like other sequels in the past. After getting a whiff of its pretentiousness and unnecessary, science fiction mumbo-jumbo, you'd rather watch the first film the minute "2049's" closing credits come up. Rating: 1 and a half stars.